Popi Rani Das doesn’t remember much about the night her husband tricked her into drinking a glass of acid. She remembers she had not been feeling well that day and went to bed with a fever. And she remembers waking up thirsty and asking her husband for water, and him passing her a cup in the dark. After that, her memory goes dark. Das’ husband had always been abusive to her, angry that her family had not provided enough of a dowry. But Das never expected to become the victim of an acid attack. She soon learned there were many women like her, all under care at the Acid Survivors Foundation Hospital in Bangladesh. But while other women were treated for their injuries and sent home, Das could not move on. The acid used in Das’ attack destroyed her esophagus and a portion of her stomach. It also left so much scar tissue on her trachea (breathing tube), that only a pin-sized hole allowed air in. Her voice was but a rasp. After several surgeries, doctors at the hospital told Das they could not repair her esophagus and there was nothing more they could do for her. Because she needed to use a blender for the food she forced into her feeding tube, Das had to stay at the hospital just to have access to electricity. She was there so long, staff had almost forgotten she was there. Which is why, when a Canadian team of surgeons came through the hospital for a tour, the staff forgot to introduce them to Das. 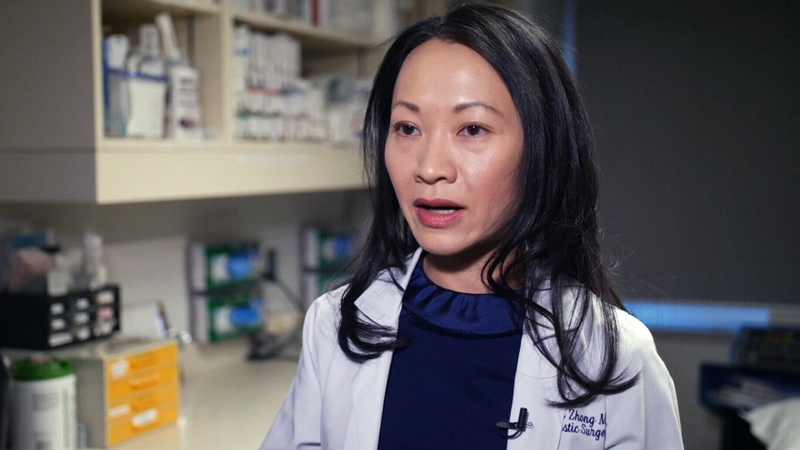 But Dr. Toni Zhong, a reconstructive surgeon at Toronto’s University Health Network, noticed Das, sitting quietly in her windowless room at the end of the hallway and asked to hear about her story. Dr. Zhong was stunned to learn that Das had already had 10 surgeries with little success. “She was in chronic pain and seeing this woman feeding herself through this tiny little tube, obviously not sustaining her weight, it was just horrible to see,” Dr. Zhong remembers. Dr. Zhong asked to see Das’ charts and surgery history. Canada had The Herbie Fund to help bring children to Canada for life-saving treatment, but nothing for adults like Popi. So Dr. Zhong started her own “Popi Fund” and managed to raise hundreds of thousands of dollars. It’s since been transformed into a new foundation called UHN Helps, to bring patients from developing countries to surgeons in Canada. Popi was flown to Toronto in February. During three separate hours-long surgeries, they repaired her larynx. They also reconstructed a new esophagus for her using material grown from tissue in her arm. Since her stomach was destroyed by the acid, they took her small intestine and pulled it up through her abdomen and chest, attaching it to her new esophagus. The medical staff donated their time and the hospital services were covered by donors. “It really is a privilege taking care of somebody who has the ability to overcome such a terrible event in their life, and to be able to survive in spite of everything that has happened to her,” said Dr. Ralph Gilbert, head and neck surgeon at the University Health Network. Over the last eight months, Das has had to learn how to swallow again and how to eat. She consumes small meals that bypass her stomach and go straight into her small intestine. Now, she’s learning to living life the way she used to, grateful for what Canadian doctors have done. “My life was very dark before coming to Canada, it was very painful for me,” she told CTV News through a translator. Dr. Zhong says she is delighted her hospital’s surgical team, therapists and social workers were able to help Das. “To think that even two years ago, this woman could not even swallow her own saliva and she was at constant risk of her saliva going down her airway and causing fatal pneumonia. And now she describes to me her favourite foods are cookies and ice cream. It is amazing,” she says. Dr. Zhong says Das has also recovered her sense of self, transforming into an independent, confident young woman. “The fact that we are at the other end of the story and she defeated all these challenges and has come out and is healthier and happier than I ever seen her, I can’t help but feel extremely emotional,” she says. As Das prepares to return to Bangladesh to live with her mother, Ajanta Rani Das, she is offering thanks to the surgeons, speech language pathologists, and social workers who have helped her. “I have gotten much more than I expected,” she says. The UHN Helps foundation that Popi inspired will now grow, accepting more international patients with complex medical problems who need sophisticated and technologically advanced medicine. Canadian doctors routinely travel abroad. But now more patients like Popi will be brought here. 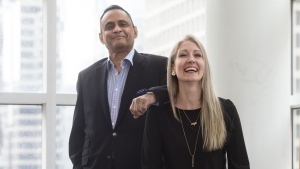 ”What we want to do is build up a fund to have the resources to take on a case like this and work on how to make it happen and make sure they can get back to a meaningful life,” says UHN’s surgeon in chief, Dr. Shaf Keshavjee. Popi says her husband has never been brought to justice. She and her mother asked for charges to be laid against him, but police declined, saying they couldn’t find him. The reality is that these acid attacks continue, at a rate of about five a month in Bangladesh. Women and children are most often the victims. Popi Rani Das, who survived an acid attack in Bangladesh, talks to CTV News about undergoing surgery in Toronto. Dr. Toni Zhong, a reconstructive surgeon at Toronto’s University Health Network, speaks to CTV News.